The Constitution of the United States of America is the supreme law of the United States. It was adopted on September 17, 1787, by the Constitutional Convention in Philadelphia, Pennsylvania, and later ratified by conventions in each U.S. state in the name of "The People". It has since been amended twenty-seven times, the first ten amendments are known as the Bill of Rights. 1. When was the American Constitution aproved? 2.Why did some people not want to ratify the Constitution? 3. How many branches of the goverment are there in the Constitution? 4. 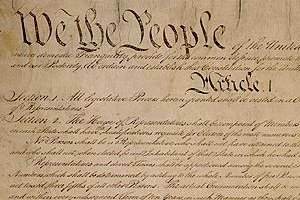 How can the American Constitution be changed? 5. Which are the most famous changes that have applied to the Constitution? 6. Name some rights protected by the "Bill of Rights"
7. Name one amendment that talk about slavery and describe what right it gives. This page was created by Antonio Romero & Isabel Pérez using Web Poster Wizard.